On a vacation to York PA, visit one of the PA attractions located in the area on a fun vacation getaway. Enjoy seeing a shoe-shaped house, watching how snacks are made or how a motorcycle is put together. This area is close to Lancaster and Gettysburg, so history buffs, outlet shopping lovers, and antique and boutique lovers will find this area of the state bursting with things to do. Utz snacks are popular in Pennsylvania so you can take the whole family to the plant for a tour. 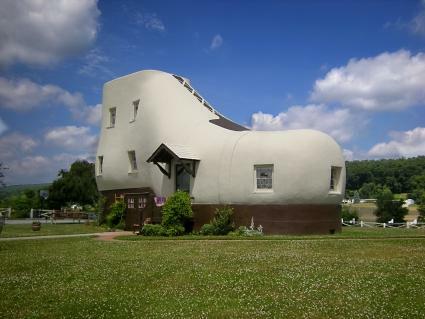 The house shaped like a shoe is awesome! We actually saw this house featured on a television show. There's some neat history regarding this house. Wood framed house shaped like a giant shoe. You'll be amazed at the size of the house and the great architecture it was built on. Watch a movie, tour the factory floor and see manufacturing and assembly areas. There's a special area for kids ages 12 and under plus a gift shop. This is a must see for motorcycle lovers of all ages! Utz makes snacks including potato chips, pretzels and cheesies. Watch the snacks being produced and learn more about them on the wall display about their history. An outlet store is nearby at 861 Carlisle St. Hours are Mon-Sat 8 AM-7 PM and Sundays 11 AM-6 PM. Enjoy visiting the Pennsylvania attractions in the York area!